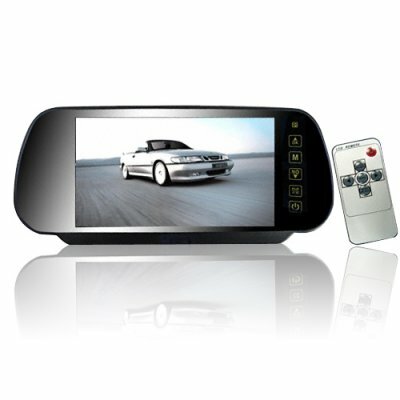 Successfully Added 7 Inch Rearview Mirror Monitor - Bluetooth + Touch Button to your Shopping Cart. 7 Inch Rearview Mirror Monitor - Bluetooth + Touch Button. Multi-function rear view mirror monitor for displaying video feeds from rearview cameras and Bluetooth enabled handsfree / headset communication. A safety and convenience car accessory, the CVECL-705H will not only automatically display images from your rearview camera as you reverse, but can act a total handsfree Bluetooth call center (with handsfree, headset, A2DP music playing, a MIC IN and include microphone, and phone number caller ID) for even more added safety as you drive. Other excellent features include dual built in loud speakers for listening both to music or conversations from your bluetooth cell phone, as well as an additional Video IN for other video devices such as a car DVD player. A great car upgrade, easy to install in almost any make or model of car, available at a factory direct price from Chinavasion to you. Order yours now and start making your life just a little bit easier. Very satisfied with the picture quality, the best I've seen so far. The added BT works very good, just remember to turn the volume up for the handsett profile.